Create and print your family tree with this genealogy software. You can enter the names the birth- and deathdays and the parents of all persons. Additionally you can save a picture and a resume for every person. Then you can arrange the persons in a tree structure. Finally you can print it out. Family Tree-Printery was rated with "Good Choice" by software directory DownloadBlast.com. 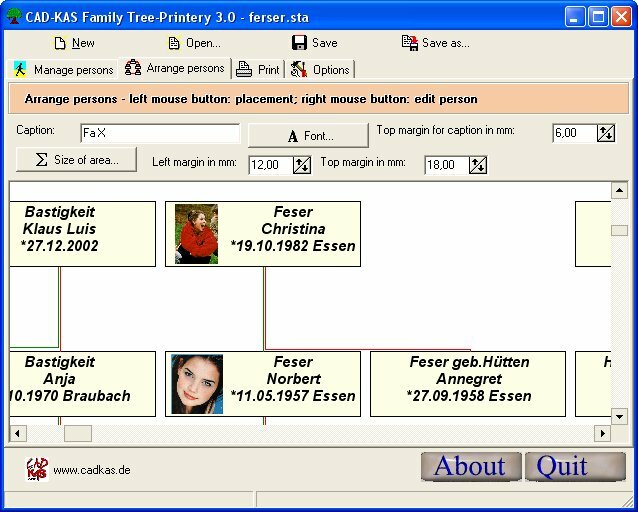 Family Tree-Printery was rated with 5 stars by software directory topshareware.com. Family Tree-Printery got the "Softempire King" title by the SoftEmpire.com team. Family Tree-Printery has been awarded with the 5 stars award by software directory www.sharewareplaza.com.